June 20, 2013 by Verle L. Bell, M.D. Dear EHYEH, I do believe that you are and that you will reward me as I diligently seek you. Thank you for giving me being which flows from your own eternal being. ! Help me to climb the mountain of your wisdom and love and explore peak after peak. Dear EBED if you, the co-creator of all, did not hesitate to become a suffering servant why should I not revel in each opportunity to serve others? Thanks for being such an awesome example of love in action. Dear EL OLAM I’ve got forever with you, help me to quit fussing about time and grab all that you have for me in the current situation and rest in the assurance of forever to come. 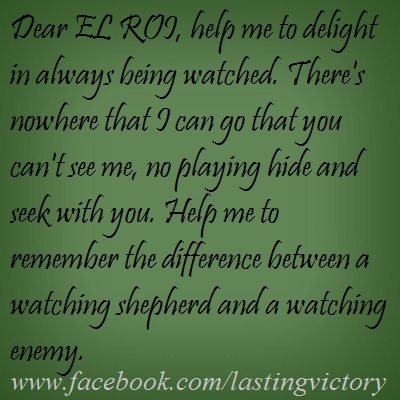 Dear EL ROI, help me to delight in always being watched, there’s nowhere that I can go that you can’t see me, no playing hide and seek with you, help me to remember the difference between a watching shepherd and a watching enemy. Dear TSEBAOTH, you could have called an infinite number of angels, or made a few more for the occasion, destroyed your enemies, and come down from the cross! Thanks for staying there till it was finished and my sins were firmly nailed to that cross. Now you are again free to wield that power so help me to lean on that power and not fear the forces of this world. Dear QEDOSH, Fill me with an awareness of your holiness in me, remind me that I am the temple of the holy one, my holy one, the holy one of [Verle]. I’ve always wanted peace to mean no war going on around me. Help me to have so much peace inside that I can revel in the privilege of being in the middle of battle, a fellow soldier with you Christ. Dear TSEDGENU I can stand in your presence dressed in your righteousness alone faultless to stand before the throne, WOW! What cleansing power. What could wash away the sin of the chief of sinners? Nothing but the blood of my TSEDGENU. Dear husband ISH, This one is hard for me. It’s not that I don’t love you but I’ve been practicing the role of husband so long it’s hard to shift. Help me to let you provide for me, protect me, guide me and set the direction for our life together, to let you be the groom and I the beloved bride. Dear ESH OKLAH, this name sounds scary but please burn out the idols in my life. Don’t just reduce them to ashes but consume them away so that there is no residue left. Dear TSEMACH, you are the vine and I am the offshoot, as you abide in the father let me abide in you and as you have reaped a great harvest may some of your fruit come as your life giving water flows through me. Remind me that a twig off of the branch is dead and only lives as it abides. Dear TSUR, My rock, a sure foundation, immovable, cleft for me that I might find shelter in you, help me to rest more securely in your solid rockiness. Dear MELEK, I’m a child of the king! with Jesus my savior I’m a child of the King! Prince Verle, Hah! Help me to picture it and act with the assuredness that is fit for one of the royal children of the king of the universe, the king of kings, Lord of lords, supreme ruler and my ABBA. Dear EL KANNA, Thank you for fighting for our relationship against all the things that I and the world try to let in between. Thank you for ensuring that they would all let me down and leave me empty until I let you, my tremendous lover, be first in all, my all in all, to whom I give total surrender. Dear MACHSEH, You are my refuge and strength a very present help in trouble. Help me to fly to you more quickly for the strength I lack, so that we may sally forth to fight once more. This entry was posted in NAMES OF GOD and tagged el olam, holy one of israel, lord of hosts, prince of peace, servant of god, verle, WEAPONS OF WARFARE. Bookmark the permalink. I loved this series on the names of God I just wish I knew how to pronounce them! Fortunately, God provides an awesome translation service. We pray best we can, and the Holy Spirit translates into God-talk. When we try to talk French, they tend to have bad attitudes and pretend not to understand. On the other hand God is delighted when we try to say his name. Remember that Hebrew itself was completely lost and no one knows exactly how it was spoken, but you could contact a Messianic Jew and ask them. I’m sure that would be an interesting experience.